A new low-cost, low-risk memory solution offering unlimited endurance and safe data storage at power loss is now available from Microchip. 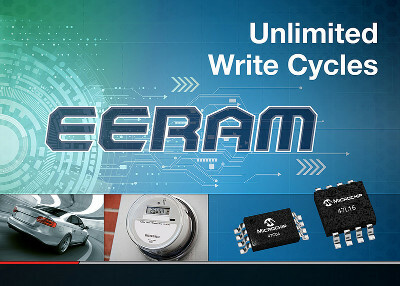 This new I²C EERAM memory is an easy-to-implement, non-volatile SRAM memory that is ideal for applications that need to constantly or instantaneously record, update or monitor data including metering, automotive and industrial applications. EERAM is a standalone SRAM memory with shadow EEPROM back-up on a single chip that helps automatically retain contents of the SRAM memory when system power is lost. The EERAM offers instant random writes to the array with no write cycle delay. The I²C EERAM family is available in 4 Kb and 16 Kb densities and comes in standard 8-pin SOIC, TSSOP and PDIP packages. EERAM is available in 3.0V and 5.0V options and in industrial and automotive temperature ranges (-40°C to 85°C and -40°C to 125°C) and is also available in automotive grade.